What is a TTA (Tibial Tuberosity Advancement)? The TTA is Dr. Garcia’s preference for managing a patient with a torn cranial cruciate ligament. This is based on his experiences of performing a variety of cruciate ligament repair techniques for over 16 years. Dr. Garcia currently performs over 80 TTAs each year ranging in pet size from 10-280 pounds. Dr. Garcia performs the surgery with assistance from his trained surgical technicians. 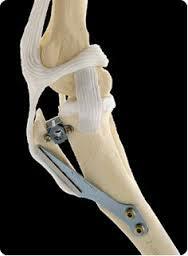 He examines the health of the cartilage in the joint and assesses the health and integrity of the menisci in the joint. Approximately 50% of the patients have a torn medial meniscus and the damaged portion is removed and in either case the medial meniscus is released to decrease the risk of future tears. Following this, the TTA procedure ensues. After Surgery what is the aftercare required once we bring our pet home from the hospital? Most of the time, your pet will stay one night in the hospital or overnight care facility. Your pet will have a small bandage covering the wound. This should be removed within 24 hours. Your pet will go home with a course of antibiotics, an anti-inflammatory drug, and some oral pain medication. Sometimes additional methods of pain control are prescribed. Do not allow licking at the incision, this increases the risks of infection. It is not unusual to see a little swelling in the lower hock or ankle joint starting at 3-5 days after surgery. This is migrating fluid or edema from the surgery site. Warm moist compresses will enhance increased blood and lymphatic flow to assist in resolving this within a couple days. There will be staples or stitches in the wounds in two locations, one location at the site of the main surgery, and a second small skin incision where an apparatus was applied during the procedure to maintain bone alignment and to possibly correct some malalignment in the bone. You will recheck with your Veterinarian at 10-14 days to have the staples or stitches removed. You will recheck at 6 weeks from surgery to have radiographs taken of the surgery site to assess bone healing. If all is progressing well, a recheck at 10 and 14 weeks may be required before the patient can return to normal activity. What level of activity restriction is required with a TTA? Think of the aftercare as Two Phases. The focus during the first phase is to create an environment for the bone to heal adequately. Therefore; no running, jumping, rough play, multiple stairs, or off leash activity when your pet is outside is expected. Walking around the house is acceptable, however, when unsupervised; consider crate or small room confinement. Your pet should always be on a leash when outside and outside only to eliminate and carefully walk around on the leash for 5-10 minutes. After the bone has an early union and of adequate strength, the focus is to properly condition and strengthen the soft tissues of the leg and the knee which are experiencing different mechanical forces now that the geometry of the bone has changed. 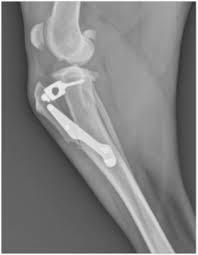 At this stage, once radiographs reveal the presence of adequate early bone healing, progressively longer leash walks are allowed. This is when more involved physical therapy can begin as well. Still no off leash activity during this time is expected. Patients can return to normal activity in the 14-16 week time line depending on their progress.